Chris von der Ahe knew next to nothing about baseball when he risked his life's savings to found the franchise that would become the St. Louis Cardinals. Yet the German-born beer garden proprietor would become one of the most important--and funniest--figures in the game's history. Von der Ahe picked up the team for one reason--to sell more beer. Then he helped gather a group of ragtag professional clubs together to create a maverick new league that would fight the haughty National League, reinventing big-league baseball to attract Americans of all classes. 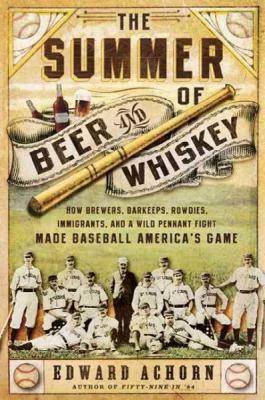 Sneered at as "The Beer and Whiskey Circuit" because it was backed by brewers, distillers, and saloon owners, their American Association brought Americans back to enjoying baseball by offering Sunday games, beer at the ballpark, and a dirt-cheap ticket price of 25 cents. The womanizing, egocentric, wildly generous Von der Ahe and his fellow owners filled their teams' rosters with drunks and renegades, and drew huge crowds of rowdy spectators who screamed at umpires and cheered like mad as the Philadelphia Athletics and St. Louis Browns fought to the bitter end for the 1883 pennant. In The Summer of Beer and Whiskey, Edward Achorn re-creates this wondrous and hilarious world of cunning, competition, and boozing, set amidst a rapidly transforming America. It is a classic American story of people with big dreams, no shortage of chutzpah, and love for a brilliant game that they refused to let die. Edward Achorn, a journalist and Pulitzer prize finalist for distinguished commentary, is the deputy editorial pages editor of the Providence Journal and author of Fifty-Nine in '84: Old Hoss Radbourn, Barehanded Baseball, and the Greatest Season a Pitcher Ever Had. He has won numerous writing awards and his work appears in The Best Newspaper Writing, 2007-2008. His reviews of books on American history appear frequently in the Weekly Standard. He lives in Barrington, Rhode Island.